Our greatest fear is that when we die we 'will become nothing. Many of us believe that our entire existence is only a life span beginning the moment we are born or conceived and ending the moment we die. We believe that we are born from nothing and that when we die we become nothing. And so we are filled with fear of annihilation. The Buddha has a very different understanding of our existence. It is the understanding that birth and death are notions. They are not real. The fact that we think they are true makes a powerful illusion that causes our suffering. The Buddha taught that there is no birth, there is no death; there is no coming, there is no going; there is no same, there is no different; there is no permanent self, there is no annihilation. We only think there is. When we understand that we cannot be destroyed, we are liberated from fear. It is a great relief. We can enjoy life and appreciate it in a new way. To illustrate this concept, Nhat Hanh looks to the clouds. Literally. You can imagine the cloud being born. Before being born it was the water on the ocean's surface. Or it was in the river and then it became vapor. It was also the sun because the sun makes the vapor. The wind is there too, helping the water to become a cloud. The cloud does not come from nothing; there has been only a change in form. It is not a birth of something out of nothing. Sooner or later, the cloud will change into rain or snow or ice. If you look deeply into the rain, you can see the cloud. The cloud is not lost; it is transformed into rain, and the rain is transformed into grass and the grass into cows and then to milk and then into the ice cream you eat. Intellectually, all of this makes perfect sense. I get the Buddhist concept of anitya, or impermanence. The fact that everything is in a constant state of flux is backed by science as well as personal experience. After all, in what meaningful way am I the same person that I was 10, 20, or even one year ago? Alas, my intellectual understanding of anitya and of "no birth, no death" isn't really helpful to me. "We may be intelligent enough to understand this, but to understand it intellectually is not enough," writes Nhat Hanh. "To really understand this is to be free from fear. It is to become enlightened. It is to live in inter-being." 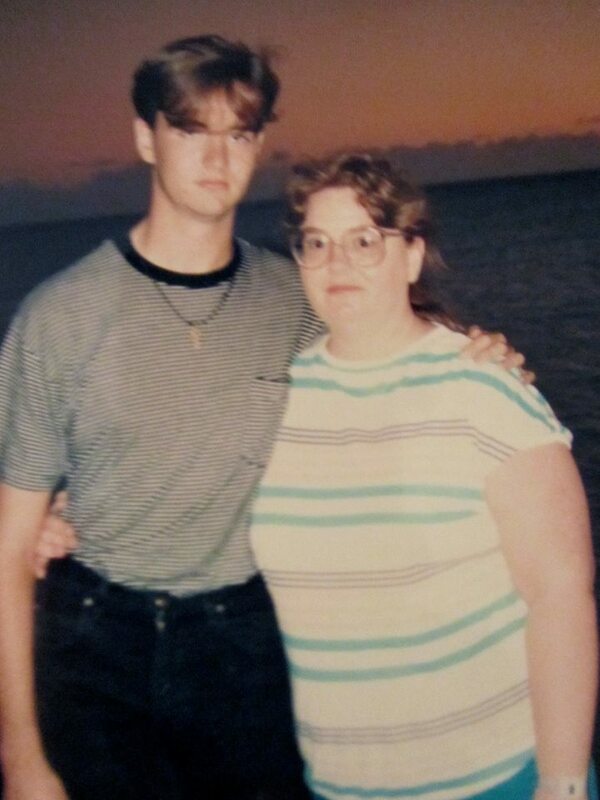 A Goth and his mom, 1990. Like so much suffering, my difficulty in fully accepting impermanence stems from attachment (as in the Second Noble Truth of Buddhism). I am attached to the current manifestations of my loved ones, and to a much lesser sense, myself. As an example, consider my mother. We were very close. She died unexpectedly at the age of 48. It was a terrible loss for me, I was devastated. I listened to this song by The Cure over and over until I couldn't listen to it anymore. I slipped into a state of depression lasting years. Walking slowly in the moonlight through the rows of tea plants, I noticed my mother was still with me. She was the moonlight caressing me as she had done so often. Very tender, very sweet … wonderful! Each time my feet touched the earth I knew my mother was there with me. I knew this body was not mine alone but a living continuation of my mother and my father and my grandparents and great-grandparents…. These feet that I saw as "my" feet were actually "our" feet. Together my mother and I were leaving footprints in the damp soil. From that moment on the idea that I had lost my mother no longer existed. All I had to do was look at the palm of my hand or feel the breeze on my face or the earth under my feet to remember that my mother is always with me, available at any time. That does indeed sound wonderful, but getting to this level of acceptance is incredibly difficult for me. It goes back to impermanence and attachment. I remain attached to the impermanent manifestations of my mother that I knew and loved throughout my life. I miss her terribly. There is a strong part of me that longs for an afterlife in which we will be reunited. Seeing her in myself or in nature or whatever just isn't enough for me yet, though I am trying. Meditating with a cat and Godzilla. The path to greater understanding and moving beyond our fear of death, according to Thich Nhat Hanh, is meditation: "Non-fear is the greatest gift of meditation. With it we can overcome grief and our sorrow." I think there is some truth to this. 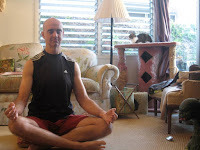 Meditation has definitely helped me in a number of ways. But will it help me the next time someone I care about passes away? I don't know. I hope when that time comes I will be better prepared mentally and spiritually then I was in the past. I'm certainly a different person now, and I will be a different person in the future. It all comes back to anitya, whether I like it or not.